Pill boxes help keep medication and vitamins organized. This double pack of pill boxes are perfect for traveling or keeping one at work and one at home. 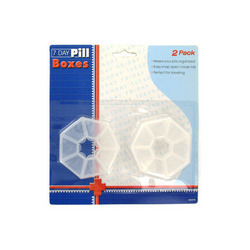 Has a modern hexagonal design and is transparent so pills are easily visible. Compartments are labeled with the first letter of each day in a raised style. Also has braille markings for the seeing impaired. Easily snaps open and close. Comes packaged on a blister card with hanging hole. Each compartment is 1 1/4" x 1"(at its widest) 7/8". The pill boxes are 3" in diameter and 5/8" height.